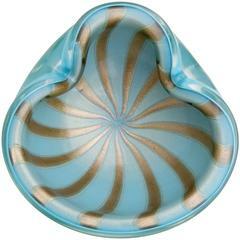 Beautiful Murano hand blown white, gold and aventurine flecks Italian art glass bowl with stripe design. Documented to designer Alfredo Barbini, circa 1950-1960s. The piece glitters in the light. 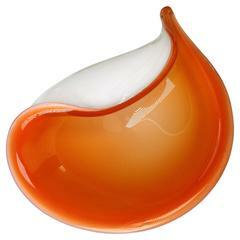 Has a decorative folded rim. Measures 6 1/4" x 6". Also available in blue with white stripes (item LU974111368701), black with white stripes (item LU974111436173) and white with orange stripes (item LU974112250871). See last photos. 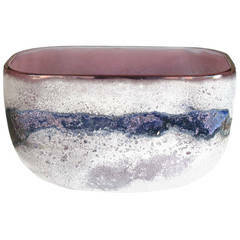 Gorgeous and large Murano handblown pink, gold and aventurine flecks Italian art glass bowl. Documented to designer Alfredo Barbini, circa 1950-1960s. The piece measures 8 1/2" x 8".